Century is one of the largest martial arts accessory brands in the world. If you have a read any of the reviews on this site you know we are generally big fans of Century’s products. This is because they are both well design and well made to generally last a long time. 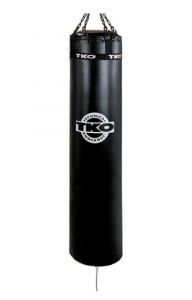 We cover several Century heavy bag stands in the reviews below. 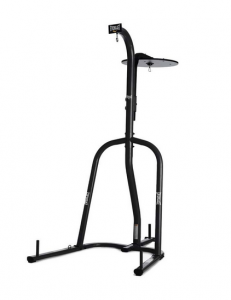 If you need a stand then definitely make sure to find out whether one of these stands will work with your punching bag and your training regimen. The Century Heavy Bag and Speed Bag Platform is a made of steel and both a heavy bag and a speed bag can be hung from it. 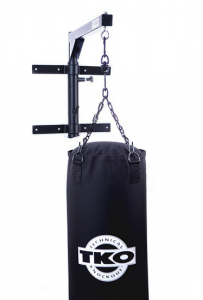 The speed bag platform adjusts between 67 and 79 inches and uses a ball bearing swivel to allow for fast action. The heavy bag hanging component does not adjust for height, but this isn’t really a concern as long as you have a decent length heavy bag. The stand has 3 pegs on the bottom that weights go on in order to keep it stable. The weights are necessary to prevent the stand from moving around the floor, or tipping over during use. You can also bolt the stand to the floor if you want to make sure it is fully secure. Once the stand is stabilized, hitting a heavy bag hanging from it is good for developing power and endurance, however is not ideal for training fight strategy as the user is unable to take angles or sufficiently circle around the bag and target different angles. Using the speed bag platform is sufficient, since many speed bag workouts tend to require a target that does not swing too far. 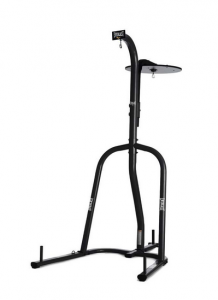 This Century heavy bag stand is a solid, durable, long-lasting piece of equipment and we strongly recommend it to those who want a quality heavy bag stand with the added benefit of a speed bag platform. 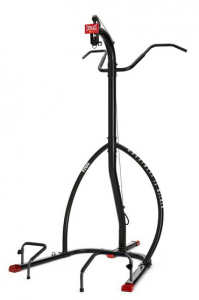 The Century Punching Bag Stand is made out of heavy duty steel tubing. It is easy to assemble and can hold heavy bags weighing up to 120 lbs. There are 3 pegs on which to put weight plates. You need to add weight plates to increase the stability and prevent it from sliding about the training area. 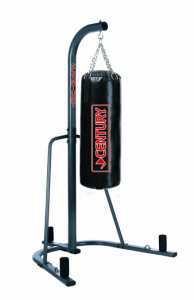 This is one of Century’s most basic heavy bag stands; a simple design lacking any additional features such as a speed bag platform. 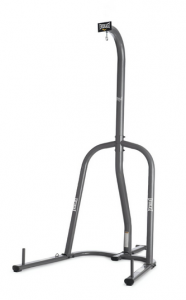 It is somewhat taller than most other heavy bag stands, allowing for better use by taller customers. The stand is a well-built and should be a long lasting product. It is ideal for heavy bag routines that focus on developing power and training endurance, but it limits circular footwork so it is not ideal for strategic purposes (this is true for all stands). 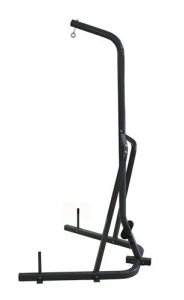 Since the stand is basic, it tends to be much cheaper than most other heavy bag stands. We heavily recommend this Century heavy bag stand for consumers looking for a basic, inexpensive, well-constructed stand. While this stand isn’t made by Century, it is another good choice to consider. 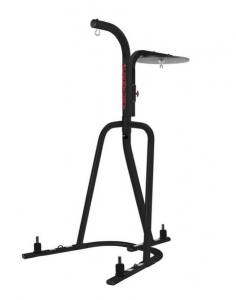 The Champ Heavy Bag Stand is made by Amber Sports. The stand is a constructed of heavy gauge steel. 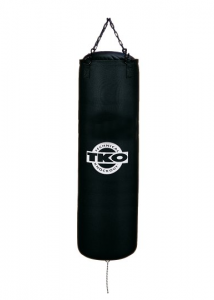 It is relatively easy to assemble and is designed to support most heavy bags up to 100 pounds. Like most other heavy bag stands, it has 3 pegs for placing weighted plates to make the stand stable and not move too much while in use. Like almost every other stand, weights for stabilization are not included, so you will need to purchase them separately. The Champ is a very simple design. It does not have any additional features, nor does it need them. It is a solid, well-built product with one purpose: to hold a heavy bag. This stand is ideal for heavy bag routines that involve working on power and fitness, but not so much for fighters looking to train circular strategy as the stand itself limits the usable space around the bag (this is true for every stand which limits 360 degree access). Since it is not a name-brand product like Everlast or Century, it tends to be less expensive than some of the competitors. 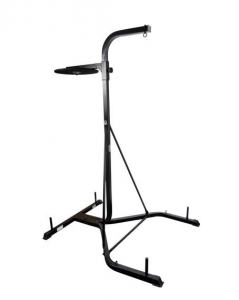 We recommend this stand for consumers looking for a basic, inexpensive, well-constructed heavy bag stand and are concerned with functionality and not name recognition. 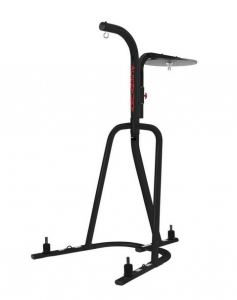 If you need a heavy bag stand, but want to consider more options then definitely check out our other heavy bag stand reviews. We cover stands from Everlast, Title and more, so you should be able to find a stand that meets your training needs at a price point you can appreciate. Let us know if you have any questions about any of the stands reviewed here.